I had the boccocino sandwich with basil, tomatoes and alfalfa on black Russian bread. It tasted fine – nothing spectacular. It is exactly as it looks in the photograph; the description on the menu makes it seem more appetizing than it really is. 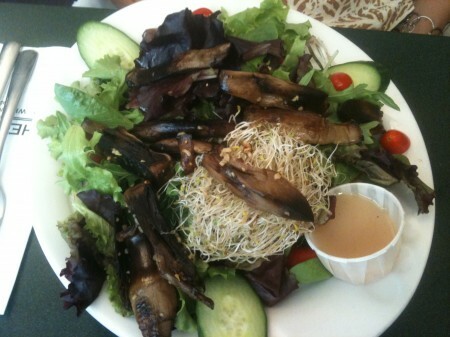 My friend ordered the portobello salad (vegan/vegetarian option) which she polished off easily. The waitress actually forget to give her the accompanying side of bread – but she remedied this immediately after we alerted her. Chez Nick’s is an average brunch/lunch joint that is more hype and novelty than anything. Not a bad place to eat, but not the best either. Tags: Alfalfa, Breakfast, Cucumber, Diner, Greene Avenue, Lunch, Montreal, Olive Oil, Pesto, Russian, Salad, Sandwich, Tomato.